Australian Fever tree is what Eucalyptus is lovingly called as, for its therapeutic values of treating fever and respiratory infections. As one among the most universally used essential oils, Eucalyptus grants excellent relaxing effect on the mind and relieves excruciating pain in the body as well. With more than 700 varieties of Eucalyptus, the most preferred essential oil of Eucalyptus is extracted from the aromatic leaves of the Eucalyptus globulus tree by steam distillation. Eucalyptus is known with different names in Sanskrit like Tailapatra, Sugandhapatra and Tailaparna. This tree belongs to the Ayurvedic family lavang kul. It is popularly known in India as ‘Nilgiri taila’ as the most aromatic and healing variety grows in Nilgiris hills in south India. 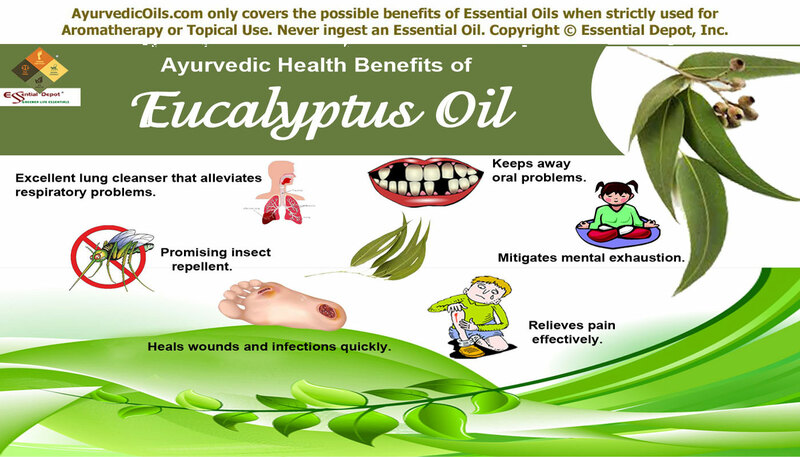 Ayurvedic preparations make use of Eucalyptus oil for the treatment of tuberculosis, bronchitis, cold, cough, asthma, sinusitis, fever, throat infections and certain other respiratory ailments along with mental fatigue, sluggishness, rheumatism, kidney infections, malaria, neuritis, dandruff, acne, insect bites, herpes simplex and muscular problems. Indigenous to Australia, Eucalyptus oil is the instant home remedy for everything ranging from headache to muscular pain and this tree is widely spread across India, New Zealand and Australia. Initially, this oil was used in the native topical ointments in primordial Aboriginal medicines for treating severe wounds, sinus congestion, fungal infections and cough. Now this oil is widely used in all facets including industrial, medicinal and perfumery. Historical references state that it was Captain James Cook with Daniel Solander and Joseph Banks who found various species of Eucalyptus in Endeavour River, Northern Queensland, and Botany Bay in 1770. Until this time none of the collected Eucalyptus species E. gummifera and E. platyphylla were named and it was named only in 1777 when the Eucalyptus variety found in Bruny Island, Tasmania was taken to the British Museum in London. The French Botanist L’Heritier named it as Eucalyptus obliqua, where all the species of the Eucalyptus family share a common feature of having oblique leaves, which indicates the leaves that have leaf blades of unequal length and do not meet up the petiole in the same situate. Eucalyptus is a famous food for the koala bears and an extensive source of food for wildlife in many countries across the globe. Australians used Eucalyptus leaves in preparing tea or infusions for treating fever, sinus congestion, cold and rheumatic pain. This oil was used in the English hospitals for cleaning urinary catheters in the 19th century. The export of Eucalyptus oil ruled the global market in 1870 and various Surgeons during 1880s used Eucalyptus oil at the time of surgery as an antiseptic. The curative benefits of Eucalyptus oil then quickly spread to other alternative and complementary medicinal practices like Greco-European and the Traditional Chinese Medicine. According to the Gas chromatography report, Eucalyptus oil constitutes of 11 chemical components that contribute to its distinctive fragrance, remedial properties and quality. Eucalyptus oil is enriched with about 79% of 1,8-Cineole constituent. The major constituent that contributes to the healing property of Eucalyptus essential oil is eucalyptol (promising antiseptic), which is another name for cineole. It also contains flavonoids (antioxidants that are plant-based), tannins (aids in reducing inflammation) and other volatile oils. The table below on the Gas Chromatography report talks about the principal chemical constituents and its role in granting the therapeutic and other attributes to Eucalyptus oil. These components are responsible for the remedial properties of Eucalyptus oil including antioxidant, antiseptic, anti-inflammatory, expectorant, decongestant, mucolytic, mental stimulant, regenerative, diuretic, diaphoretic, antispasmodic, germicidal, deodorant, alterative, anti-diabetic, disinfectant and insect repellent. Every human being is born with all physical and mental faculties in palpable order and all that he/she needs to do is to understand the ways of using them perfectly to lead a serene life. This understanding of life is known as ‘Ayurveda’ and the very word means ‘knowledge of life’ (Ayur-life and Veda-knowledge). This traditional wisdom has its name etched in the history before 5,000 years and is said to be in existence before 1500 B.C. The principles of Ayurveda have been documented in the Atharvaveda, one among the 4 major Vedas (sacred books) of the Hindu Mythology. Nearly 114 poems in this Vedic literature depict the causes, effects and the remedies of various diseases of mankind. Ayurvedic system strongly believes that everything on earth is a part of nature and is made up of the five vital elements of nature including fire, water, earth, space and air. Earth is said to represent bones and muscles, fire stands for the biological reaction and metabolism of the body, air aids in breathing, water is the blood and space is the soul or spirit that lives within. The philosophy of Ayurveda states that every individual is made up of a unique individual constitution comprising of three vital biological energies known as doshas. 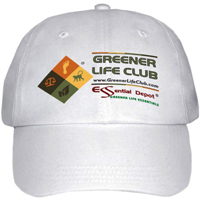 These vital energies are nothing but a representation of the five vital elements of nature. According to Ayurveda, sickness is a symbol that the human body is in disharmony with nature and there is imbalance of any one or all of the three doshas. Ayurveda says that disease is an opportunity to know the imbalances of the system. It believes in identifying the root cause of an illness instead of treating the symptoms alone. Ayurvedic remedies vary from individual to individual even for the same medical condition as it trusts that every individual is a unique creation and the treatment for their illnesses should also be unique. The major Ayurvedic remedies are essential oils (the life-force of plants), herbs, Abhyanga (the art of Ayurvedic massaging), yoga, meditation, prayers and following an Ayurvedic routine. These remedies are prescribed in such a way that they treat the imbalances of doshas and help to live in harmony with Mother Nature. Eucalyptus oil is known for increasing pitta dosha and pacifying kapha and vata dosha with its unique medicinal, warm and camphoraceous to lemony aroma. Adding 2 drops of Eucalyptus oil in steam inhalation instills a relaxing effect on the mucous membranes, cleans the nasal passages, expands the blood vessels and permits more oxygen intake by the lungs, thus assisting trouble-free breathing and cleansing of lungs. This oil have been used since the traditional times in the treatment of sinusitis, bronchitis, nasal and chest congestion, cold, sore throat, asthma, tuberculosis, runny nose and throat infections. Eucalyptus oil has excellent decongestant, expectorant, antimicrobial, anti-inflammatory, antiviral and antibacterial properties that make its use vital in many cold rubs, ointments and other oral preparations for respiratory problems. The study on Eucalyptus oil extracted from the aromatic Eucalyptus tree of the Nilgiri hills, India by the Medical Department, Government of Madras, India has proved that Eucalyptus oil works as an effective expectorant and relaxes phlegm and mucous deposits in the nasal and respiratory passages. The presence of phenolic compounds, the plant based antioxidants in Eucalyptus oil helps in fighting against respiratory infections by strengthening the immune system during flu, cough, cold and other illnesses. 2 drops of Eucalyptus oil added to cold compress or applied to foot soles helps in reducing fever. You can also add 2 drops of this oil in ointments or rubs and massage it gently on the chest, throat and back for relieving nasal and chest congestion. Whenever headache hits us badly, the first thing that comes to most of our minds is Eucalyptus oil. Yes! This powerful pain-relieving oil has analgesic and natural pain relieving qualities. A recent double blind study have illustrated that Eucalyptus oil and Peppermint oil applied together on temples and forehead proved better in relieving headache better than pharmaceutical aspirin and acetaminophen. Eucalyptus essential oil alleviates pain by spreading its warming effect on the skin, causing numbness on the painful parts and relieves pain quickly. Its anti-inflammatory, analgesic and diuretic properties assists in relieving muscular pain, rheumatic pain, joint aches, arthritic pain, lumbago, stiff muscles, fibrositis, nerve pain and migraine pain. Massaging the affected parts with 2 drops of Eucalyptus oil mixed with 1 drop of Peppermint oil and 2 ml of coconut oil can help in lessening pain and reducing swelling by eliminating the excess water deposits, salt , uric acid or other toxic substances causing inflammation in case or arthritis or rheumatism. You can also add 3 drops of Eucalyptus oil in warm bathing water and go for a re-energizing bath to calm your aching muscles and nerves. The essential oil of Eucalyptus oil is rich in 1,8-cineole (eucalyptol), which is an effective antiseptic that eradicates bacteria and other harmful microbes that can cause bad breath and other oral problems. It is also said that the antibacterial effect of this oil assists in fighting against periodontopathic bacteria and cariogenic bacteria, which is responsible for causing decay of tooth. The best way to used Eucalyptus oil for combating germs and bacteria causing oral problems is to add 1 drop of this oil in a cup of water and use it as a gargle twice a day. This is the major cause for the use of Eucalyptus formula in various mouthwashes and other oral cleansers to fight cavity, gingivitis, halitosis and plaque. Eucalyptus essential oil instills a cooling effect on the mind and helps repair and rejuvenate negative feelings and subtle emotions. Numerous studies have proved that this oil has been effective in alleviating stress, mental fatigue, depression due to illness, lack of concentration, mental aversion and other strong emotions. 1 drop of Eucalyptus oil mixed with 1 drop of Lemon oil and added to your vaporizer or diffuser can grant mental clarity quotes the book ‘Ayurveda and Aromatherapy’ by Bryan Miller and Light Miller. You can also add 2 drops of this oil in your bathing water in the morning or before going to bed to calm your nerves, soothe your senses and leave you invigorated and balanced. You can add 10 drops of Eucalyptus oil to your 2.5 ounce spray bottle and spray it in your work station to assist in clarity of thoughts, improved concentration, logical thinking, increased intellectual power and focused approached even towards the most complex task of the day. The effective germicidal and antiseptic properties of Eucalyptus oil promotes quicker healing of burns, infectious wounds, abrasions, skin ulcers, cuts and dry itchy patches. Eucalyptus oil has antimicrobial and germicidal effects that curb the growth of perilous bacteria like Staphylococcus aureus and E.coli and a 2004 research on ‘A study of the antimicrobial activity of oil of Eucalyptus’ proves this effectiveness. Apply 2 drops of Eucalyptus oil mixed with 1 ml of jojoba oil and apply on the wounds, acne, candida, blisters, boils (it is safe on chicken pox boils also), shingles, herpes simplex and other skin infections for visible results. It is also said that Eucalyptus oil was effectively used for treating childhood infectious diseases like typhoid, cholera, mumps, measles and scarlet fever. You can add 2 drops of this oil warm bathing water or mix it with 1 ml of coconut and massage it gently on foot soles to reduce fever and other infectious health conditions. 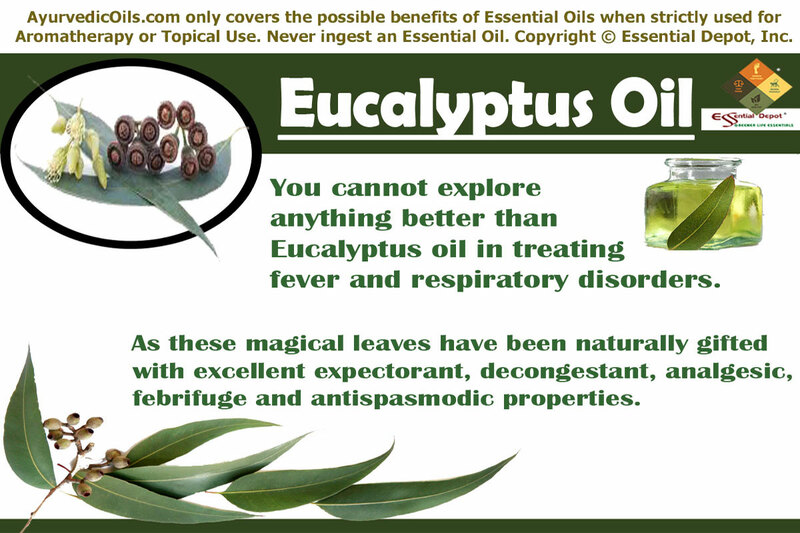 Eucalyptus essential oil is a potent insecticide and pesticide. It is a renowned formula in many insect repellents in the market and the oil of Eucalyptus mixed with lemon oil is said to keep away ticks. The Australian Aborigines used Eucalyptus oil as an effective insect repellent to protect them from mosquitoes, ticks and fleas. Using this oil can assist in preventing critical diseases like malaria, Lyme disease, West Nile virus and Rocky mountain spotted fever. Add 2 drops of Eucalyptus oil to 2 ml of coconut oil and gently massage it on your scalp to get rid of lice and dandruff (anti-fungal). Mix 2 drops of Eucalyptus oil with 1 ml of olive oil and apply it on insect bites to get rid of rashes, reduce itching and redness of the skin. You can also apply this mix before going to bed to protect yourself from mosquitoes. 2 to 3 drops of this oil added to your air freshener or diffuser can give you a bug-free sleep at night. Eucalyptus oil is also effective in treating other disorders like bladder infections, skin blemishes, sluggishness, fatigue, emotional pressure, dysentery, loss of appetite, laryngitis, intestinal worms, wounds and loss of appetite. This article is restricted to educational use only and is not for substituting any prescribed medication or professional medical advice. Speak with your Ayurvedic healthcare expert before choosing the appropriate essential oils for your specific health condition and unique individual constitution. Always use essential oils for topical use in a diluted manner as certified and organic essential oils are highly concentrated extracts and may cause allergic conditions when used on the skin directly. Eucalyptus oil is safe as it comes under GRAS (generally regarded as safe) oils but never use it internally. 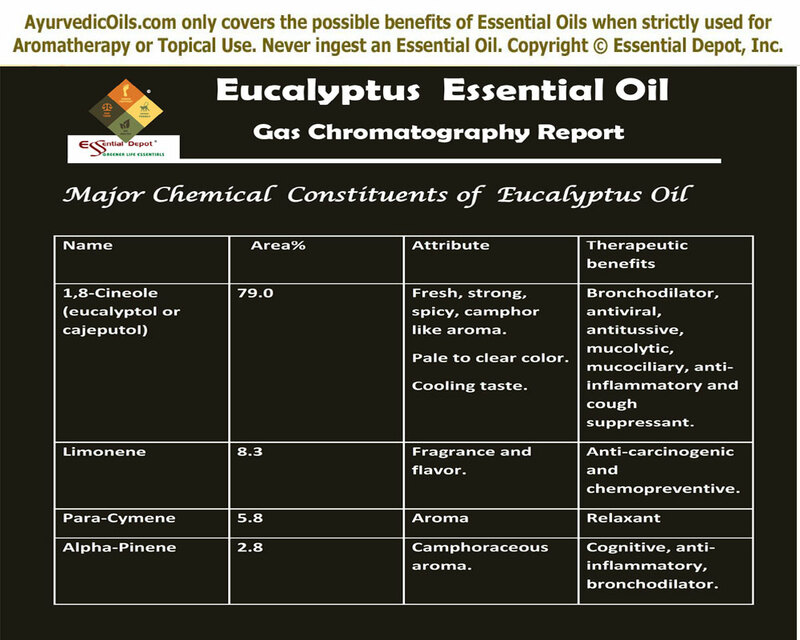 The MSDS (Material Safety Data Sheet) of Eucalyptus oil is readily available for your enhanced safety and better usage. 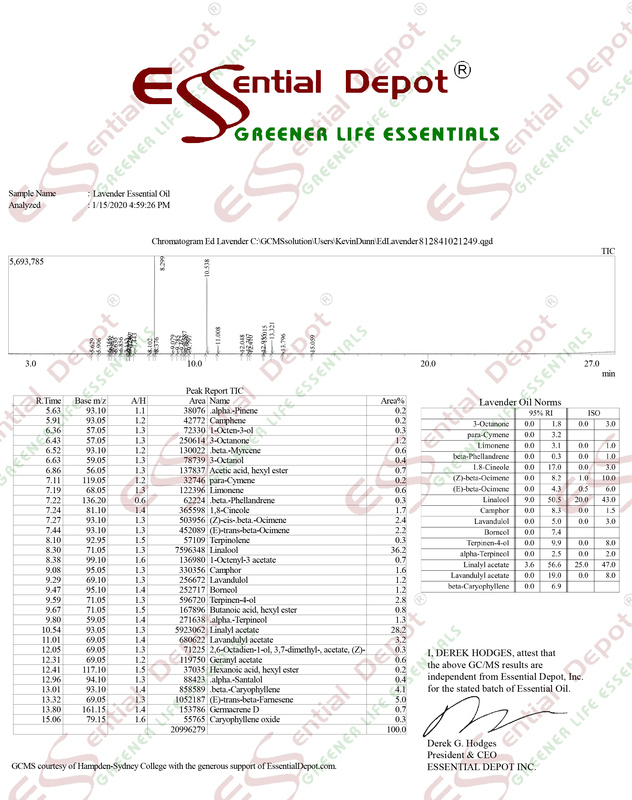 Gas Chromatography Report (GC analysis) of Eucalyptus oil. Eucalyptol is a cyclic ether and a monoterpenoid. It is identified and ascribed the name eucalyptol in 1870 by F. S. Cloez. It is a natural organic compound that is a colorless liquid, also known by various names like 1,8-cineol, cajeputol, 1,3,3-trimethyl-2-oxabicyclo[2,2,2]octane, 1,8-oxido-p-menthane, 1,8-epoxy-p-menthane, eucalyptole , eucalyptol, and cineole. The name eucalyptol was given to it based on the dominant portion of Eucalyptus globulus oil. The constituent Eucalyptol is seen in 90 percent of the essential oil in most species of Eucalyptus oil. It’s component is majorly constituted of 1,8 cineole syn eucalyptol and monoterpenes, and hence it gets its’ name Eucalyptol. 1,8-Cineole is also found in Common Sage, Bay leaves, Camphor laurel, Tea tree, Sweet basil, Wormwood, Mugwort, Rosemary, Cannabis sativa and other aromatic flora. 1,8-Cineole finds itself serving multiple therapeutic purposes such as analgesic, anti-inflammatory, antibacterial, airborne antimicrobial, antioxidant, antiviral, mucolytic, hypotensive, antispasmodic and it also increases the cerebral blood flow. In the areas of medicine, 1,8-Cineole is widely used as an ingredient in many popular brands of cough suppressant, mouthwashes, and as well as an inactive ingredient in body powder. It serves well in treating system related disorders as mentioned below. A study conducted in 2010 with details from the Aromatherapy Journal of the NAHA states that Eucalyptol does play a crucial role against Candida and fungi. It is seen to restrict the filamentation in fungi, and is also effective on intestinal parasites that cause diarrhea. It’s does exhibit anti-fungal activity on candida albicans. When the leaves of Eucalyptus globulus were taken internally during an experiment with diabetic rats, Candia albicans and its proliferation were inhibited. It can be used in the treatment of arthritis, rheumatism, muscular aches and pains, sprains and plantar fasciitis. Studies suggest that both analgesic and anti-inflammatory activity, were projected by Eucalyptus globules and Eucalyptus citriodora. 1,8-Cineole is indicated in several respiratory conditions right from sinusitis, asthma, acute bronchitis and chronic bronchitis. It is also preferred in the treatment of sore throat and infections such as laryngitis, for its antiseptic qualities. It is also used to clear the head especially when used in a combination of Peppermint and Rosemary under conditions of nasal congestion, coughs, cold, flu and pertussis. 1, 8-cineole is seen to provide positive responses even under the conditions of severe respiratory illnesses such as lung function parameters during the treatment of COPD and the common cold. Eucalyptus globules have been identified to create positive battling effects on bacterial strains which have been isolated from respiratory infections. It has been proved effective for its growth restraining activity against bacterial strains including Haemophilus influenzae, Streptococcus pyogenes, H. parainfluenzae, S. pneumoniae, Stenotrophomonas maltophilia and Staphylococcus aureus. For the skin, 1,8-Cineole is used in the treatment of shingles, herpes simplex, measles, acne, chickenpox, ulcers, wounds, boils, burns, cuts. The National Association for Holistic Aromatherapy Journal concurs, “bacteriostatic and bactericidal activity was extensively displayed by 1,8 cineole”. Eucalyptol is used as an insect repellent and as an insecticide. This oil is said to elevate territorial behavior and specifically attracts the male bees. This was done so these males would periodically leave their territories to forage for chemicals such as cineole, to attract and mate with females, to synthesize pheromones.